It was a disappointing result for the hosts but there were still some positives to write home about after a spirited display. India U-17 produced a valiant display in their FIFA U-17 World Cup opening clash against United States U-17 but still came up short as they lost 3-0 at Jawaharlal Nehru Stadium in New Delhi. Many players – from both sides – had their moments, and Khel Now takes a look at five players who particularly stood out. One Indian player the Sony cameras zoomed in on more than skipper was Dheeraj Singh and understandably so. Although he ended up shipping three goals, he was one of the crucial reasons – alongside centre-backs Anwar Ali and Jitendra Singh and USA’s woeful display in the attacking third – why India found themselves in the game for as long as they did. Additionally, the goals he conceded weren’t down to him, as he only conceded a penalty, double deflection and a one-on-one situation. His being a vocal presence at the back and wise ball distribution will prove decisive for the Colts as the tournament progresses. 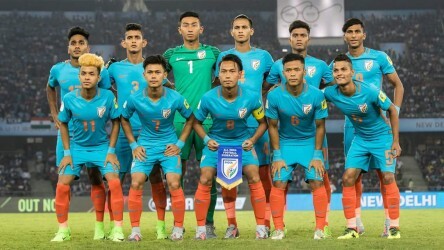 The Indian youth internationals’ unanimously electing 16-year-old Amarjit Singh Kiyam as the skipper seemed an eyebrow-raising move, but the Manipur-born lad’s performance on Friday night proved he very much deserves the captain’s armband. Playing essentially as the third centre-back, he ensured India negated the threat Josh Sargent and co. imposed to an extent – except when the USA found the back of the net. He’ll look to learn from the few mistakes he made to bounce back against in Ghana and Colombia. Besides, with many players looking visibly upset at various stages during the game, he, as the captain, shall look to lift the dressing room’s spirits. With India keen to crowd the middle of the park, the onus was on Blaine Ferri to create chances and he did deliver. Spraying passes to the attacking players from central midfield, he proved he was as vital as the more celebrated players on the roster. Picking out through-balls almost at will, Ferri proved what a left-footed visionary can do in a little extra space and why the world still raves at them. His positioning and passing didn’t only hand the USA the upper hand in possession but also curbed India’s chances of stringing passes together in their territory. One of the handful of players in the USA squad to not be from a huge club, he produced a performance that would put scouts from the MLS clubs on alert. Although the United States failed to do a lot in India’s defensive half, their playing out from the back was sometimes impressive and nobody started more attacks from the back than full-back Christopher Gloster. Often rendering his Indian counterpart helpless, he sent in crosses that resulted in numerous chances. He also had the Indian wingers in his pockets, as he denied them the time and space to drift in or sprint forward. The way he changed the game from left to right with pin-point deliveries was a treat to watch. Should he keep up his fine chemistry with the USA forwards and solidity at the back, he will prove a vital cog in the team that has aspirations to lift their maiden FIFA U-17 World Cup trophy. With poster boy John Sargent failing to produce the kind of performance usually expected of him and Ayo Akinola’s proving ineffective on the night, Georgia-born youngster Andrew Carleton rose to the occasion. The Major League Soccer forward produced a display that left the Indian backline flustered and the American supporters impressed and capped it off with a deft finish in the dying minutes of the game – after rounding the Indian goalkeeper – completing a superb counter-attack to seal the game for John Hackworth’s side. His performance down the flanks proved that, contrary to popular belief, the CONCACAF U-17 Championship runners-up aren’t a one-man team.